I didn't mean to do it. 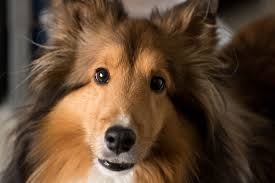 I didn't intend to get another dog - at least not until Obie (my 13-year-old sheltie) goes to doggie heaven. But, of course, it isn't every day that you hear the sad story of five rescued little sheltie puppies who were living in a barn. And so on Monday evening, little Ollie, who is approximately 5 ½ months old, came to live with Obie and me. Do you ever wonder whether something happened strictly by chance (a coincidence) or whether it was by God's intervention? There's often a very fine line, isn't there? Well, Monday evening was a dark, cold, rainy, miserable night. I had just gotten home from picking Ollie up in Fairless Hills and stopping at Res-Q-Pet's veterinarian to have him microchipped. The adoption was a somewhat lengthy process (Ollie had already come for a home visit last week) and I was tired. It was about 6:15 pm when I let both dogs out into the fenced-in backyard at the parsonage - yes, I was hoping Ollie was mostly housebroken (let's just say he's still on that learning curve). It didn't take much more than a minute for Ollie to find a defect in the fence and scoot out of the yard. Fast. Before I could even get the gate open to chase him, he was long gone. And it was dark. And raining. It was rush hour on Almshouse Road. All I could think of was the traffic, the woods next door, the farm across the street, and a little puppy who doesn't know where he lives or even who I am. I decided he was lost forever. I panicked. I ran for a flashlight. I called the representative from Res-Q-Pets who said she would come right out and help search (she told me later that the couple she was meeting with about adoption said they wanted to come with her!). I cried. I called the police. I freaked out. Then I noticed a couple of cars parked at the front of the church. It was only 6:20 pm - too early for the 7:00 pm Bible study, but I ran over anyway in case someone could help me search. I must have sounded frantic when I got inside. "Is anybody here? I need help searching for a puppy!" Turns out that Susan Paulsworth got to church early for the study because of her work schedule. She had brought a chicken sandwich with her from McDonald's, and as soon as she parked and got out of her car, she noticed a little sheltie near the front of the church. She walked over to him (I imagine the chicken sandwich smell was pretty good bait!) and he let her pick him up. She and the Czarnecki's were sitting in the copy room trying to call me but their cell phones weren't cooperating. Boy, did I breathe a sigh of relief! I still can't get over the way that all the stars happened to line up. There was a Bible study at church that night. Susan arrived 45 minutes early (who DOES that?!) just as Ollie was walking by in the dark and he let her pick him up (dogs really DO have a sense when a person is a dog-lover, don't they?). Was it just another example of pure coincidence? OR was God's hand somehow involved? We'll never know. But just like so many other "coincidences" that happen to us every day, it's worth pondering and meditating and wondering about. And it's ALWAYS worth giving God the glory.